I’m sorry you haven’t been touched in a while. It’s all my fault. Your strength, when I felt you today, reminds me of what we can accomplish together. I want to use you. Over & over again. Holding the power you possess, under my hands, makes me feel like I can do anything. And I know you will be right there, ready to go when I need you. You always have been, no matter how long I stay away. You are the greatest a girl could want. 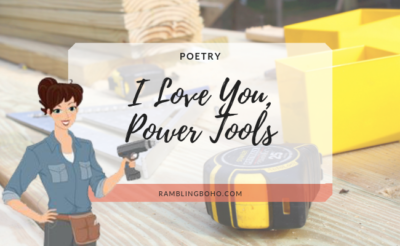 I love you, power tools!